Hiya, today is Jo’s Happy Birthday. Jo is one of my lovely Passionettes and she is a darling, such a down to earth person kind and very funny, I love her to bits. She loves blue and she cannot stop using Crumb Cake so it was only natural that I combined the two. 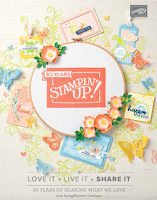 Crumb cake card base, Baja blue layer embossed with the Vintage Wallpaper folder and the Big Shot, half 1” circles in Pear Pizzaz were used to create the big scallop edge and the glorious Top Note die cut shape in Very Vanilla was stamped using the lush Vintage Vogue stamp set. The flowers stamped in Baja Breeze ink and the middle ones rolled into the Pear Pizzaz ink pad to create the two tone effect, the border was inked and stamped in crumb Cake ink and the small leaves dotted about in Pear pizzaz ink. I love the soft combo of this card and I hope Jo likes it too. Pear Pizzaz seam binding is providing a different texture amongst the raised up flowers. I stamped the flowers firstly straight onto my die shape then stamped again and popped them on dimensionals, for a really fab looking effect, very 3 D.
Rhinestones complete the soft and feminine look and the lovely sentiment comes from the new level 2 hostess set Something to Celebrate and was punched with the lovely Modern Label punch. I hope you like it and Jo I hope you have had a fabulous day. While away I missed a few of my team’s birthdays and I will share their cards with you within the next week. I need to show a lovely surprise that awaited me. My travelling documents for my next holiday, want to know the best bit about it? IS ALL FREE !! 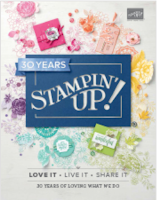 You might not know that each year Stampin’Up! demonstrators can achieve an all expenses paid trip to fabulous destinations where they end up being spoilt rotten. I was lucky enough to visit Monaco last year (read the summary of this trip HERE), I am getting ready to spend some happy times in Prague this year and feel extremely lucky to have achieved next year’s trip to Vienna. Is so fab to spend a few relaxing days with my fellow demonstrators who have achieved the same trip, revisit old friendships and form new ones. Of course those incentive trips are the reward for the work I put in but also they depend on the work my team are putting in, without my supporting customers or my lovely team, trips like this simply would not be possible. LOVE this card! It has it all going for it! TFS! wow .. this card is so so so so nice !!! I'm facinated !! See you in Paris ? Convention ? Soooo wished i were coming Prague! oh well never mind!